A decade on can the magic be rekindled? It's Predator... but even better! One of the greatest soft synths gets a comprehensive makeover and improves in functionality, although the interface is a tad dated. Stunning sound. Ridiculous number of presets. Modulation interface feels 'old'. Manual isn't finished. It's hard to believe that Predator - still Rob Papen's (and coding wizard Jon Ayers') most lauded synthesiser - is a decade old. Upon its release in 2007, it blew us away with its almost-single-screen interface, huge selection of waveforms, unrivalled effects and stellar sound. The long-awaited Predator 2 (VST/AU/AAX) sticks with the same largely skeumorphic design and keeps all the main synthesis controls immediately accessible from the front. With its considerably expanded architecture, this results in an even busier interface than that of its predecessor. Clicking the Easy Page button switches to a much sparser GUI containing just the most important synthesis controls, the X/Y Pad and the Variation feature, which enables a variable degree of randomisation to be applied to the synth parameters and/or the FX section. Distilling Predator 2 down to just enough parameters for broad-strokes changes, Easy Mode gives beginners and live performers a friendlier, less cluttered environment in which to work. Coming back to that X/Y pad, this serves as a spectacular modulation source, with up to eight parameters from throughout the synth assignable to its X and Y axes, and the depth of each assignment set independently. In Live mode, the red 'puck' can be dragged around with the mouse or automated in the host DAW. The real fun comes when you switch to Record mode, however, in which your movements are captured to memory as a 'path' for playback in Play mode. The replayed movement of the puck along this path is open to plenty of creative tweaking, including looping, speeding up and slowing down, syncing to host tempo, and quantising to path resolution, background grid and time. Predator 2 is a thoroughly worthy successor to the original and we find ourselves even more in its thrall than we were in 2007. It can also be triggered polyphonically (each note starts its own path, all of them animated in the display), monophonically (one shared path that restarts with each new note) or in Free mode (one shared path that runs continuously, regardless of note input after the first). Impressively, you can even manipulate the path by dragging its constituent nodes around in Edit mode, which updates non-destructively to reflect the Point and Space Quantize settings. A well stocked menu of edit Commands provides a toolbox of handy processes, too, including Set to Circle/Square/Line, etc, Reverse, Flip, Rotate and Spiral, the last of which prompts for a number of 'turns' from which to construct an inward or outward twist. 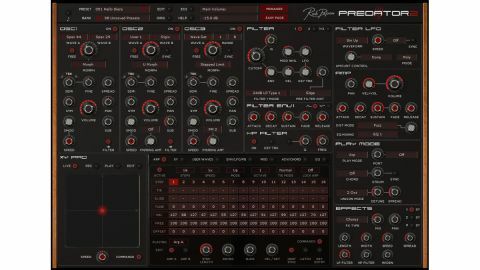 Predator 2 is still a three-oscillator instrument, with a sub oscillator tracking each one an octave below, Oscs 2 and 3 syncable to Osc 1, and a variety of FM and ring modulation options onboard. The Spread knob dials in unison-style stacking, and the brilliant symmetry/pulse width modulation LFO is still built into every oscillator. Predator 2 also features the same expansive library of 128 waveforms, but now each oscillator can host two of these waveforms at once, with the Morph knob in between blending them in various styles, consisting of simple mixing, additive morphing, wavetable-style interpolation, and phase, frequency and ring modulation effects. You can also create a wavetable (or Wave Set, in Predator parlance) of up to eight waves in the User Wave tab and load that into an oscillator, in which case the Morph knob transforms into an index control, scanning through the waves in stepped, mixed or morphed manners. Of course, the Morph knob is accessible as a target inside the mod matrix, and all in all, Predator 2's well-judged, transformative multi-wave functionality more than makes amends for v1's lamented lack of wave selection modulation. It's ace. Predator 2's waveforms are generated by an additive synthesis engine, so it's presumably no great conceptual leap to afford the user the ability to design their own through the wrangling of partials. And that's exactly what Papen and Ayers have done. The User Waves tab of the Multi-Page centres on a graphical editor in which waveforms are drawn with the mouse, either freehand or by dragging lines out to create ramps. You can load any of the 128 preset waves as starting (or, indeed, ending) points; there's an optional quantise grid; and shaping processes (Stretch, Filter, Distort, etc) can be selected from a menu, tweaked with one or two contextual knobs (Low and High for the Filter Shaper, for example), auditioned by clicking the thumbnail waveform, and baked in with a click of the Apply button. Alternatively, switching the editor to Partials mode reveals a zoomable view of the 128 amplitude and phase partials for the waveform, all editable using the same functions from Wave mode. You get eight User Wave slots to fill with your own harmonic scribblings, and the whole bank is made available to all three oscillators as a 'Wave Set' wavetable, scanned through using their Morph knobs. Copy and Paste between slots makes it easy to quickly create meaningful progressions, and the only thing missing is the ability to import short samples and have them converted to Wave Sets. Over in the Filter section, Predator's previously simple second filter has been beefed up to match the main one, with the addition of all five hardwired modulation options, including its own ADSFR envelope. These two filters can also now be run in parallel, and they even offer a pair of Split modes for filtering the left and the right channels independently of each other. The massive menu of 27 filter types remains unchanged, but Filter 1 now has three pre-filter distortion algorithms, with the upper-harmonic-enhancing Dirty joining the established Smooth and Edge types. A third filter has also been bolted on - a simple resonant high-pass with keytracking. The Play Mode section has been greatly diversified, with the separation of unison from the other functions, and a vastly improved Chord generator. Up to six unison voices are now available to every triggered voice, no matter which Play Mode is active, and chords of up to eight notes can be manually defined in the Multi-Page, complete with variable Strum (for spacing notes out, guitar strum style) and per-voice panning. The Effects sections - one of Predator's best features - has been left alone, and thus still gives you three slots to fill with your choice of 28 excellent modules, from reverbs, delays and modulation processors to dynamics and distortions. However, the Multi Distort module now also appears in hardwired form in the Amp section, bringing its 11 distortion types to Predator 2's main architecture; and the Equalizer module may not see much action any more thanks to the superior new integrated EQ. This is housed in the aforementioned tabbed Multi-Page, and consists of two three-band parametric EQs - one pre-effects, one post - each topped and tailed with high- and low-pass filters. Edits are made directly in the display or using the knobs below, and even without any shelving options, the detailed frequency shaping introduced by Predator 2's EQ proves supremely useful. Also found in the Multi-Page panel is the new Mod Matrix, wherein 20 'free' modulation assignments can be made (v1 had eight) in Basic or Advanced mode, the latter adding to the Amount control with adjustable Upper and Lower range limits, and static Offset. In terms of mod sources, v1's two LFOs and two ADSFR envelopes have been doubled in number to four of each, and blessed with the addition of such niceties as phase control and access to the eight User Waves for the LFO, and Pre-Delay and Repeat (1-16 and Infinite) for the envelopes. The Arpeggiator has been moved to the Multi-Page, too, where it's bigger and a bit less fiddly. In fact, it's now two arpeggiators - A and B - each deployable individually or joined together for up to 32 steps of sequencing. That's a good thing, for sure, but the implementation isn't pretty, as Join mode doesn't automatically switch the view from one arp to the next as the sequence progresses. Ideally, we'd like to be able to see all 32 steps at once, but failing that, automatic switching between A and B is a must. Apart from that, Predator 2's Arpeggiator is easy to use and very capable, with sequencing lanes for pitch, velocity, modulation, Tie, Slide and grid Offset, and an extensive list of arpeggiation modes. Another new feature that workflow-savvy sound designers will fall in love with is the ability to save and load presets for each section of the synth. Every oscillator, filter, effect, envelope and LFO, as well as the Arpeggiator, X/Y Pad setup, Mod Matrix, etc, can have its current status captured in a discrete file for reloading at any time - so, so cool. And speaking of presets, v1's full vault of over 6000 patches has been ported over and encased in a better looking, more functional browser. It's a jaw-dropping universe of sounds that hours can easily get lost in. Predator 2 certainly brings Papen/Ayers' masterpiece up to date in a great many areas, while maintaining the essence of its one-screen ethos, but the interface feels a wee bit stuck in the past. There's no drag-and-drop modulation pairing, GUI feedback on the movement of modulated parameters, or real-time waveform visualisation. Of course, no developer should feel it has to incorporate these things, and we appreciate Predator 2's old- school vibes, but animated waveforms and modulation feedback are unarguably helpful in an instrument that moves as much as this one. For a second-generation synth in 2017, they're conspicuous in their absence. The X/Y Pad goes some way towards making up for it, we suppose. We're also not totally sold on the extremely dark GUI - the grey on/off and Multi-Page tab switching buttons are positively bloody minded in their user-unfriendliness. There is, however, an alternative white skin in the pipeline that we've seen and can't wait to switch to. Moaning aside, though, Predator 2 is a thoroughly worthy successor to the original and we find ourselves even more in its thrall than we were in 2007. It's far more versatile and interesting, the GUI retains that instant, hands-on feel as much as it can without getting totally crazy, and - thanks to the new features, overhauled audio engine, awesome wave mixing and, er, wavetabling, and an effects rack that still qualifies as one of the best in the business - it sounds simply phenomenal, whether it's belting out gut-punching basses, razorblade leads, ear-tingling pads or intricate FX. Resolutely reliable, sonically on-point, and enjoyably retro in its styling, you could say it's the ultimate electronic music workhorse.